Style at times calls for looking different and coming out with a distinct undertone to your costume and accessories. Different people use different methods like selecting catchy color schemes or getting clothes glow in the dark to make an impression on peers. If you feel like glowing your clothes in the dark then don’t bother about it because it is a simple process and won’t require much of your time or effort. You can either opt for a ‘temporary glow’ or a ‘permanent glow’. For temporarily giving a glow to your clothes you would require ‘glow-in-the-dark-powder’, a cup and a waterbottle. 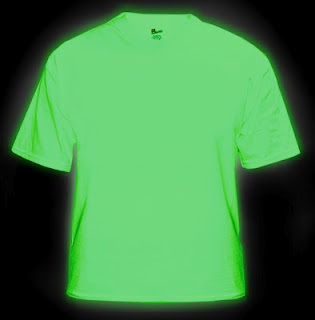 Should you go for a permanent glow to your clothes, will need fabric paint, a cardboard and a cutter. -- Prepare a glowing solution by mixing 1/2 tablespoon of ‘glow-in-the-dark-powder’ with 1 cup of water. -- Fill your water bottle with this glowing solution. Shake you water bottle well by first covering the lid on the bottle. -- Now, apply the mixture to the clothes while you wear them. Spray wherever you want the clothes to glow. Stop regularly to shake the bottle and hence ensure uniform distribution of powder in the liquid. -- Then, spray your clothes with a hair spray; it will help hold the powder in place once the water evaporates from it. -- Charge the glow-in-the-dark powder by turning on a bright light or by flashing a flashlight beam all over with a minimum of 10 seconds on every place of your clothes. -- Test your clothing by standing in the dark and check. If you don’t feel it is glowing up to your expectation then apply more spray. -- Spread the garment on a piece of cardboard. -- Trace and cut the cardboard; you may cut about ½ inch inside the outline of tracing line. -- Now place the cardboard within the clothing and then stretch the clothing. -- Now, paint the clothing with fabric paint to give it a permanent glow. You may also use a sponge for this purpose.